Cosmedics’ London Vein Centre has revealed fabulous treatment results from varicose vein removal treatment. This client had been struggling with the appearance and then the development of varicose veins in her thighs. Varicose veins are more commonly associated with the calves, because they can be seen there even through tights, leggings or stockings. Yet varicose veins can also appear higher up the leg above the knee. Once they first appear, it can be tempting to hope they’ll go away, but unfortunately once the veins have become ‘insufficient’ they will not recover and the lumpy veins will get bigger and more uncomfortable. 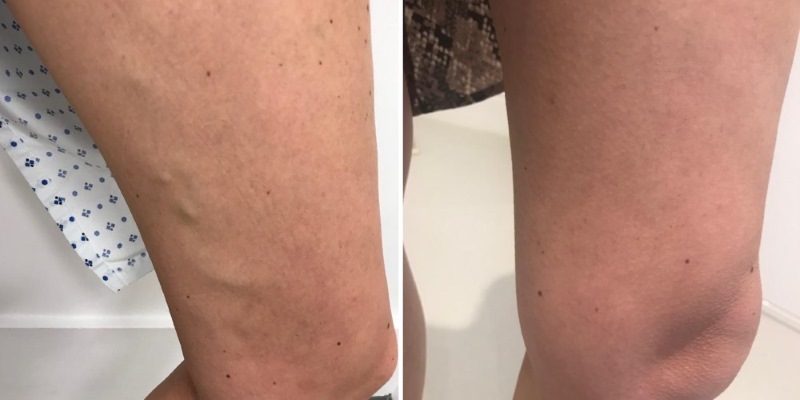 The results below show that the latest EVLA Laser Varicose Vein Removal Treatment methods give an excellent result, as if the veins were never even there in the first place. Treatment is fast and efficient and carried out on a ‘walk in walk out’ basis with no overnight stay. Laser a Revolution for Facial Thread Veins Laser, Nd:YAG or IPL for Facial Thread Veins?